As you can see, it's a combination of what you can purchase, and what you provide for your back through commitment to be your strongest, best hiking self. Back pain after a hike is a horrible souvenir to take away from trail time. But it's a wake up call you should never ignore. So it just makes sense to go down the path of back injury prevention for hikers. Let's tackle the purchasing angle first. don't wear just any old pack. A flimsy day pack, cast off by your kids or found at a rummage sale, is not the way to go. Or, at least not after more than the first few easy hikes you do. Your back muscles won't be shy about giving you feedback! 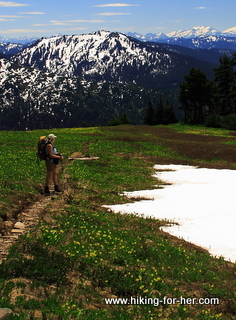 A sore back after a hike may be an opinion from your muscles about that "bargain" backpack. A hand-me-down or second hand store purchase may save money in the short run, but back pain costs you time and money down the road - or down the trail. It may even discourage you from ever hiking again! Just say no to an old used pack. a proper ventilation system to allow sweat evaporation in the interest of keeping your body temperature within normal ranges (especially important if you're a menopausal hiker). In fact I'd discourage you from paying a lot of money for bells & whistles you will never use, like an ice axe loop - not to mention the trendiest new colors. Did you know packs have hot new colors, just like runway models flaunting the latest clothing colors? Back injury prevention for hikers: start with a great pack. 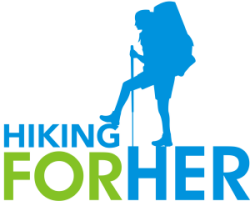 To find out how to locate the pack of your dreams along with other hiking gear, go here. Not ready to commit to purchasing the best dayhike pack yet? stop women on the trail and ask how they like their packs. ...in short, become a pack hound. How to determine if the pack you're interested in purchasing fits you? Does it loom over you? Does it hug you like a glove? Or does it feel stiff and bulky? AND you need to walk around with some weight in the pack, carried down low and representative of the amount you would carry on a trail. It's one of the best pieces of "back injury prevention for hikers" advice I can give you! Much as I love the convenience and competitive pricing of Internet shopping, I would caution you against purchasing a pack without trying on several first. Yes, I know that you can return it in the mail if it doesn't fit, but why waste time (not to mention environmental resources) until you're really clear about what you need? Find a nearby store that seems friendly and cozy up to a salesperson who is knowledgeable about hiking. Any old big box store with a limited selection won't do - you need an experienced hiker to sell you a pack! Have this person suggest packs after explaining what type of hiking you'll be using it for, and then be meticulous in adjusting each one until you can decide if it's a potential candidate. I want hassle-free reliable performance and durability, each and every time. Or you could use the Cinderella analogy! Find your princely pack because nothing else will ever satisfy you. I hope I've convinced you about investing time in finding THE pack in order to avoid back pain after a hike. Now let's look at back injury prevention strategies for hikers that cost time, rather than money. Body mechanics are a big factor in preventing back pain. Do you ever catch a glimpse of yourself in a mirror and notice that you're hunched or stooped? When you see photos of yourself, are you holding your neck at a funny angle? Do you wake up stiff or sore in the morning because you've slept on your back or stomach? Do you always sit with your legs crossed at the knee, and usually one leg always over the other? Do you get a literal "pain in the neck" during the day? These are all examples of improper body mechanics which, over time, can give you back pain and loss of mobility on the trail. So the bad news is that back injury prevention for hikers is a full time job, in terms of establishing good habits (or breaking bad ones first). worse (herniated discs, pinched nerves...big OUCH, and expensive). And it's not just wearing the pack that you must pay attention to! How do you swing it over your shoulder? Which shoulder goes first? Are you sitting or standing when you put on your pack? When you take a rest break, do you shrug off the pack and let it drop off your back, tugging your head backwards? Do you adjust the straps continually throughout the hike, or just at the beginning? Or not at all? Do you ignore feedback like pinching, soreness, pain, rubbing or hot spots? All of these motions can stress the multitude of joints in your backbone, not to mention tick off your muscles. You probably can guess that it's important to use good body mechanics every day, but especially when you're lifting and wearing your filled backpack. imagine yourself, standing up from a nice comfy moss covered log and reaching for your backpack. Do you let your dominant arm drag it over to you without bending your back (thereby stressing your shoulder AND your spine)? Do you lift the pack without bending your knees, and sort of throw it onto your back? Do you pivot as you hoist up the pack? These are negative examples of hiking biomechanics - don't continue to do them if you truly believe in back injury prevention for hikers! OK, I can hear you thinking: "So what is the proper way to put on a pack?" It depends on the size and weight of the pack, to some extent. It also depends upon your upper body strength. Bend your knees! Let the strength of your thigh muscles along with your back muscles work together to accomplish the task. Always use and adjust the chest and hip straps, because they help distribute weight into the bones of your pelvis, away from your lower back muscles. Vow to work on developing upper body strength, so you can let your arms and chest control the weight of the pack until it is properly seated on your back. Lift weights for a few minutes every day, beginning with one or two pounds until you work up to 10 pound weights. You'll love how toned and strong your muscles become. Putting on, and taking off a pack will become effortless. Yoga for hikers can be an excellent way to build upper body strength. Some of the poses are known to stabilize and strengthen the shoulder girdle. And older hikers will welcome the chance for increased flexibility. And finally, reconsider every item in that pack - is the weight justified by absolute necessity? If you can't hoist the pack up by a few fingers on one hand, it's too heavy! While we're on the topic of gaining strength, let's shift our attention to strong back muscles. Most of us sit way too much every day, and have lost flexibility over the years. You already know where I'm going with this. I know, I know: daily exercise and back stretches are a real pain. A strong vertebral column is a fantastic gift to give yourself, particularly as you age. So how to achieve it? This depends upon your personality. Maybe an exercise class, meeting a few times a week, would be the way to go. There are classes specifically targeting your core muscles - watch for ads at community centers, fitness centers, and universities. Water aerobics is a good choice if you are already experiencing knee or back pain, as it reduces the effect of gravity on your joints and provides resistance to strengthen your muscles. For those who have a more introverted nature, a home fitness routine is more appealing (ask me how I know). It's impossible to cover all of the choices you have at your disposal, but the Internet can provide you with many options, from jumping around to music in your living room (Zumba, anyone? ), to a treadmill, to Pilates, to yoga. I perch on a balance ball chair. This forces me to trigger all of the little spinal muscles, teaching them to keep my posture long and lean. I love it so much I can't go back to my "regular" office chair any more! And I notice that my posture on the trail is much taller - I don't slouch into my pack and I don't crane my neck in front of my body. I use the balance bar to do some stretching every day. My spinal column flexibility is NOT what it used to be. But this gives me a gentle way to remind my body that my back is for strength AND flexibility. If you visit a massage or physical therapist regularly, ask him/her about back strength & flexibility exercises. These therapists deal with muscles on a regular basis, and will be familiar with the various types of back pain you might be experiencing - even to the point of knowing exactly which muscle is responsible. If they give you exercises and stretches, commit to doing them every day. And speaking of the spinal column, it's held together by more than just muscles: connective tissue fibers called ligaments connect the bones, while other connective tissue called fascia acts as packing and wrapping material. And we haven't even mentioned the hard working blood and nerve supplies! They can be impinged upon, and cause trouble, too. Regular bodywork helps to normalize the functions of these fibers and essential body routes. Consider it a vital component in your plan for back injury prevention for hikers. or your back's worst enemy? A strong healthy back is a precious resource for any hiker, and that's why back injury prevention for hikers is a hot topic for those who want to keep burning up the trails! Invest in the time and gear necessary to preserve your resource, and you'll be hiking with ease and grace for decades to come. 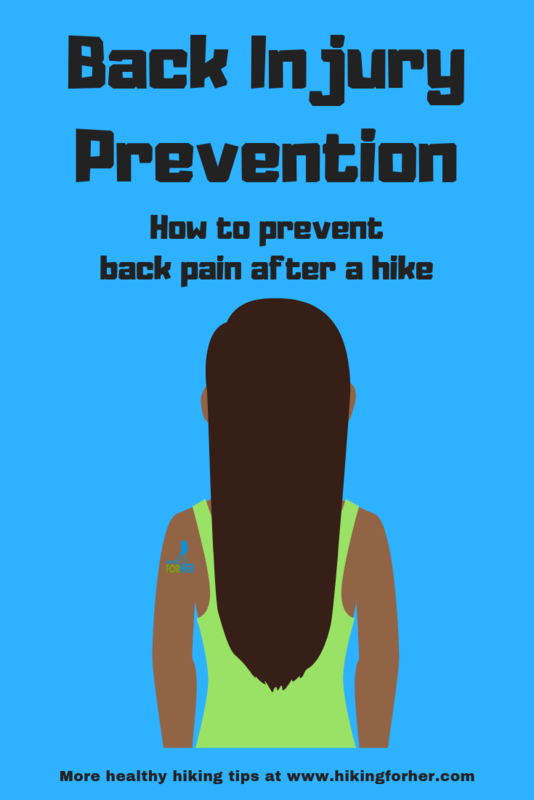 Once you get on the back injury prevention for hikers train, there will be no more sore backs, back pain or stiffness for you!